Oh thank you so much for this! I've been through all that. Even from family members and pastors. "Don't you have a 'someone' yet?" "God's taking care of me." But I've learned, in watching my friends stuff their hearts into shredders, and then watching those who wait on the Lord, and taste what is truly good- that His ways are the very sweetest. And I've tasted that reality in the freedom of my own life- a freedom I wouldn't have if I was out there playing 'snag-a-guy'. I'll stick with Him as well. Thank you for the reminder. It seems like everywhere I go even among christians people are always bagering me about finding a boyfriend or husband. There have even been times when I allowed their feelings to rub off on me and I would begin to wonder if God ever would bring the right man along. But all I have to do is look to God and let Him show me His perfect plan for my life. I know that He has perfect timing. And He will sustainme in the meantime. Thank you for reminding me of this. This is such an encouragement to read! I find I often get those same comments from other Christians. They often try to argue that waiting for God's timing is a symptom of laziness or fear. According to many, I need to be out there actively hunting for a man in order for God to provide. That, in my mind, seems to reflect a lack of trust in His faithfulness and provision! They can't understand why I don't run to register at E-Harmony or join singles groups. Yet, despite the frustration of repeatedly hearing that I'm crazy to wait on God, I have experienced some of the most peaceful and intimate times with my Loving God when I have been most patient and intent in waiting for His best for me. I'd rather trust His choices than mine any day! Thank you for not letting that incident make you stumble and doubt your beliefs. I know whenever I am met with opposition, I tend to give in, or second guess what I am defending. This post was really encouraging, thanks! Great reminder! Thanks for posting this! I agree, you don't need to go searching for a male. But don't sit in your bedroom waiting for a guy because you'll never met anyone; boyfriend or otherwise. That's right, no boyfriend for me! How foolish would it be for me to go out and try to find that certain 'someone' when all I can see is their outside looks and actions. But God can see everybody at heart level, plus He already has someone picked out for me, so I just have to wait. Great article. I completely agree with you Elizabeth! (BTW I've also found this site through "DO HARD THINGS" and also highly recommend "I Kissed Dating Goodbye" for ANY christian teen (or young adult) striving to live a pure life for Jesus. Very good books). 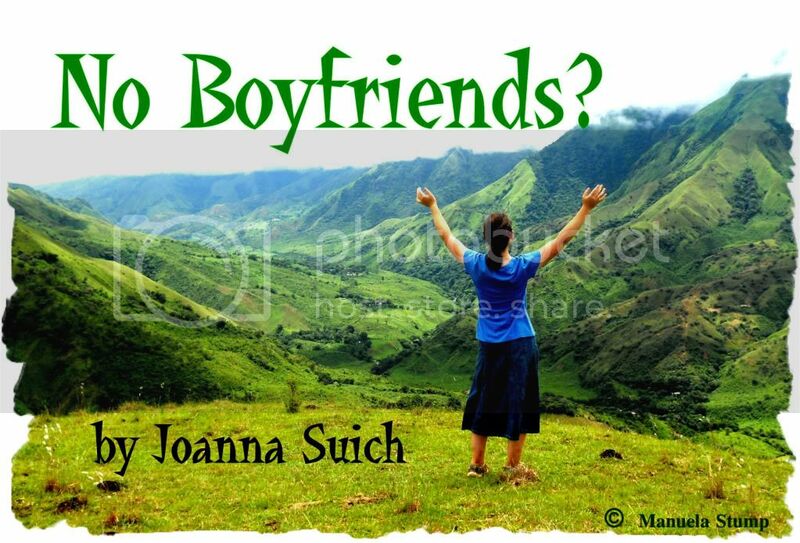 I know many YOUNG girls who seem unable to live without a boyfriend! When in reality, who they really cannot live without is Jesus. That's right! I agree with you Elizabeth too! Wish you good luck!! !